0.1 What is Dry Eye Syndrome? 1.1 How to get rid of Dry Eyes? Tears act like a mirror to express your feelings of sadness and happiness. But dry eyes will take away the chance of expressing them. Dry eyes are caused due to many reasons including environmental factors, dehydration, stress. Hence, you must need to concentrate on causes and take appropriate care to get rid of dry eyes. Often, you can easily cure dry eyes with simple home remedies for dry eyes given below. Dry eyes will occur whenever the tear glands in your body didn’t produce sufficient tears for lubrication. This situation is very painful and uncomfortable. More than 60% of the population are affecting with dry eyes. Even the children are also facing this situation. The term which describes diminished tear production is also known as Dry Eye Syndrome. Any damage to the tear glands can cause chronic dry eyes. The medical term of dry eyes is Keratitis sicca that means lack of moisture. Fewer tears will result in itchiness, dryness, and burning sensation. Dry eyes are of two types namely aqueous deficient dry eye which occurs due to lack of water and mucin deficient dry eyes which happen due to lack of mucus. Dry eyes occur due to many reasons. Some of the common causes for dry eyes are given below. The primary causes of dry eye are evaporation of tears due to decreased content of water, mucus production. Inadequate blinking of an eye also leads to red and itchy eyes. This happens at the situations including spending time in front of TV, computer, mobiles. Wearing contact lens avoids the free circulation of water in our eyes which lead to dry eye syndrome. Some types of medicines like beta-blockers, antidepressants, antihistamines decreases tear production. Deficiency of vitamin A also causes dry eyes. Mostly old age people can affect with Dry eyes. Due to aging, the tear glands will fade and gets damaged. The common symptoms when you catch up dry eyes includes the following. Eye become sensitive to light. In rare cases, you may observe excess tear production. Also, you will observe red colored eyes. 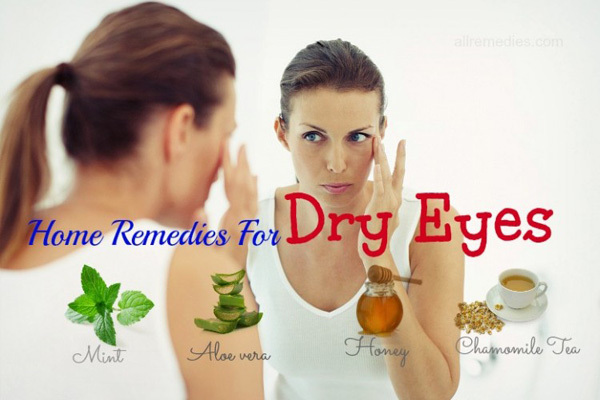 Know the best proven home remedies for dry eyes to get rid of eye infections and dryness fastly. Are you facing the irritable, dry eyes problem? Generally, these dry eyes are caused due to normal issues like stress, insufficient sleep, etc. Hence, taking proper care and making some changes in lifestyle can help to prevent dry eyes overnight. 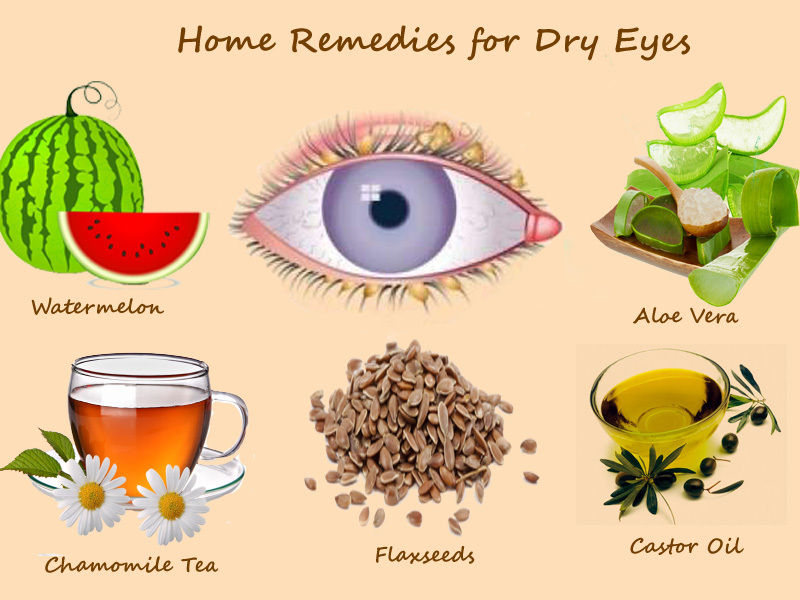 Following some home remedies for dry eyes can keep away the need of a doctor. Hence, learn how to get rid of red eyes and dry eye syndrome treatment briefly. Castor oil is one of the home remedies for dry eyes. There are a lot of benefits of castor oil for dry eyes. Castor oil is an incredible booster for lymphatic circulation. In fact, castor oil acts as water retainer and works well for dry eyes which occur due to meibomian gland dysfunction. However, this oil also helps for eye detoxification. So, it provides quick dry eye relief. How to treat dry eyes with castor oil? For dry eye treatment, pour 2 drops of castor oil in eyes. Close your eyes for at least 10 minutes. Repeat this home remedy for dry eyes daily at night until you see eye syndrome. As cucumber contains 95% of water, it is one of the dry eyes home remedies. 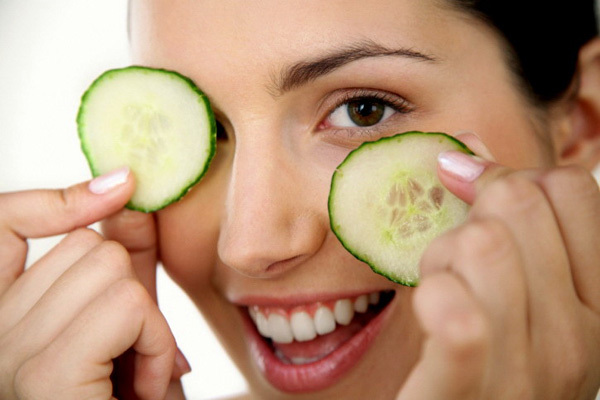 The cooling effect of cucumber can help to create eye syndrome. It eliminates the toxins which cause dry eyes and other eye related infections. Also, it contributes to numb the dry sensation and eases the symptoms related to dry eyes. Cucumber contains anti-inflammatory properties that are effective for a severely dry eyes cure. First of all, take the fresh cucumber and cut into slices. Put them in a refrigerator for a few minutes. After, close your eyes and place those slices on dry eyes. Use this natural dry eye remedy daily to obtain best results. The component Bisabolol found in chamomile has antimicrobial and inflammatory properties. Hence, it is the best solution for dry eyes. Moreover, the cooling effects of chamomile help to retain water in your eyes. Take either chamomile flowers or chamomile tea bags. Include these flowers in a cup of water. Steep for some time and allow them to cool down. Soak cotton balls in this water. Place these balls on your eyelids and the surrounding area. Repeat this treatment until you feel relief. After that rinse your eyes with lukewarm water. Do this remedy two times a day to prevent dry eyes. Warm water compress is the best remedy for dry eyes treatment. Lukewarm water helps to moisturize your itching dry eyes. Soak a towel in this water and remove the excess water. Place this warm water compress on your eyes for at least 10 minutes until you feel relief. Follow this eye dryness remedy once a day. Exposed to sunlight will dry out your eyes. To bring eye syndrome back, you must be hydrated. Hence, Watermelon is the best eye irritation remedy due to its massive watery content. Drinking watermelon juice can help to flush out toxins present in eyes. Also, the water in this fruit moisturize eyes and hence your dry eyes will be easily cured fastly. So, drink 2 to 3 glasses of watermelon juice to prevent dry eyes. Heavy salt content, lack of vitamins and essential fatty acids can make your eye dry. Fatty acids such as omega-3 and omega-6 that help to produce eye syndrome. You can find the essential fatty acids in walnuts, sesame oil, almonds. Hence, including these foods can prevent eye dryness by increasing tears production. Also, eating fresh green leafy, colored vegetables can increase Vitamin A. So, eating these home foods can ease chronic dry eye symptoms. Since Flaxseed oil is rich in omega-3 fatty acids, it cures dry eyes effectively. Research prove that Ingesting of flaxseed oil helps to retrieve your eyes back. Daily intake of 2,000 mg of this oil can produce dry eye syndrome by 85%. Hence, flaxseed oil is the best natural remedy for dry eyes. You can directly take flaxseed oil or its supplements. How to treat dry eyes naturally? Aloe vera also stood in the top home remedies for dry eyes. The antiseptic nature and anti-inflammatory properties of aloe vera throw out the toxins and other dust particles from your eyes. Also, the cooling nature of aloe vera helps to form eye syndrome. So, with no dry eye drops, you can easily treat them at home itself. Apply the aloe vera gel on the eyelids for quick dry eye relief. But keep in mind do not use this gel on the eye surface. Prevention is better than cure. Hence, it’s better to avoid an occurrence of dry eyes in spite treating after occurring. Know the best solutions for dry eyes. Environmental factors are the main cause for the occurrence of Dry Eyes. Since dry air irritates your eyes and also acts as an evaporating agent, people who have dry eyes are not allowed to stay in the dry environment. Living for a long time in the air-conditioned room can also cause dry eyes. The air coming from AC is drier than regular air. Hence, staying away from air conditioners is the best dry eye solution. Also, it is better to avoid hair dryers, car heaters, and steam. To protect your Eyes from being dry, wear goggles when you go outside. 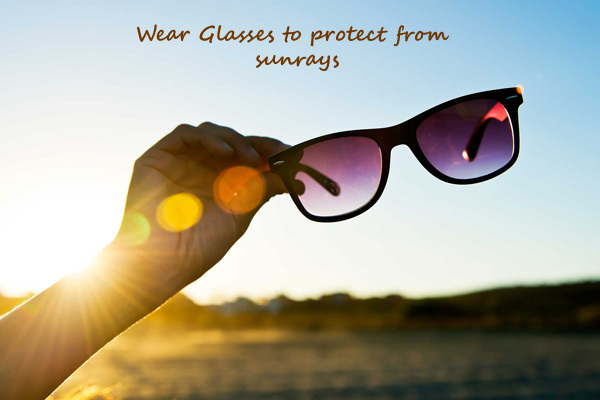 By wearing glasses, you can avoid the falling of sun rays directly to your eyes. These glasses help to create humidity and hence moisture will form in your eyes. Hence, use glasses to prevent dust, the wind which are the leading causes for Dry Eyes. In today world, every individual including working persons, students are spending more time in front of a computer. Hence, Overusage of the computer is the primary cause of dry eyes. Besides a computer, watching TV for ling hours also irritate your eyes. So, limit using computer and mobiles to cure dry eyes. It may wander you that smoking also causes dry eyes. But it’s true. Smokers are more prone to dry eyes and other eye diseases. Not only for smokers but also the person who inhale smoke will also affect with eye dryness. Besides eye dryness, people also get cataracts, glaucoma, and macular degeneration diseases. Also, rubbing of eyes will aggravate dry eyes. Because when you rub, the bacteria and dust will spread from your hands to eyes. So, avoid smoking and rubbing of eyes. Eyeliner, eyelashes and other makeups to the eye will clog the meibomian glands. Due to this, these glands will not function properly which may result in dry eyes. Hence, after parties try to remove all the eye makeup thoroughly. If you didn’t find any change after using home remedies for dry eyes, contact the doctor. Use the prescribed medicines for dry eyes treatment. Artificial drops are meant for lubricating dry eyes. They treat dry eye by providing moisture. But the artificial drops do not treat the underlying cause of eye dryness. These drops just used for treating eye redness and eye irritation. Hence, use these natural eye drops just for irritating dry eyes. If you didn’t find the difference, contact the doctor. But don’t use more than two times because the condition may become chronic and severe. You can get the artificial medicine for dry eyes from the drug store. How to cure dry eyes? If you find the chronic dry eye symptoms, better to visit the hospital to obtain dry eyes medicines. Most commonly used dry eye medicine is Hydroxypropyl methylcellulose. 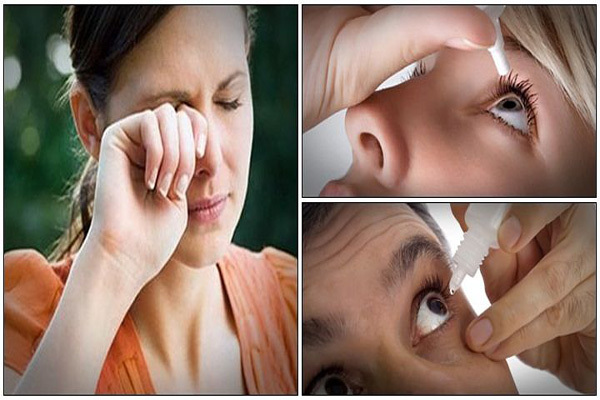 Besides this, carboxyl methylcellulose stood second place among all over the counter eyedrops. This one of the dry eye remedies if you have eyelid swelling. Also, Restasis contain drug cyclosporine which can increase tears production naturally. Pour one drop into your red eyes twice a day. Chronic Dry Eye Treatment: If your eyes are not closed fully during sleeping, you can get dry eyes. If this problem persists, get the prescribed eye ointments from your doctor. These topical eye medicines can help to lubricate eyes and remains moisture. But don’t use these ointments at daytime because they cause blurred vision. Hence, it’s better to use them at night. Unlike natural eye drops these ointments treat the exact cause of dry eyes. Besides home remedies for dry eyes, know the natural tips to avoid dry eyes, mouth. Following these tips will help to avoid happening of redness in the eye. Certain toxins, bacteria, and dust particles may damage meibomian glands that result in Blepharitis. Thereby you can see dry eye symptoms. Hence, while washing your face keep in mind to clean eyelids. You may also use mild cleansers and baby shampoos to clean eyelids. Evaporation is the main cause for dry eyes. Being hydrated is one of the eyes burning home remedies. Water acts as a metabolic booster and helps to retain the lost eye syndrome. Hence, water is one of the home remedies for dry eyes. So, drink 8 to 10 glasses of water every day for eye dryness cure. When you get strained, your eyes will become dry. 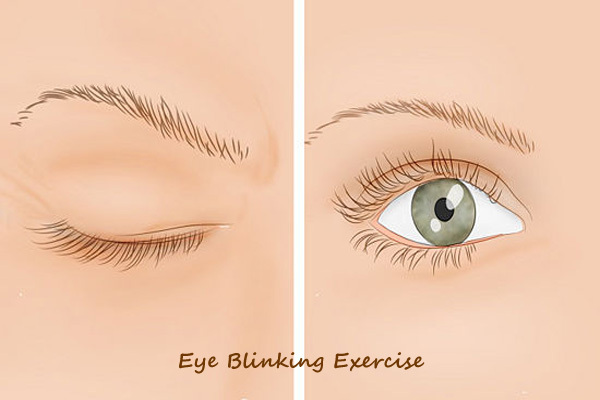 Eye blinking exercises help to avoid dry eyes by producing tears. This technique will increase circulation levels and reduce redness and irritation of dry eyes. Hence, do eyes blinking exercise for about 20 times in a minute. Also, take a break while working, studying, writing. A humidifier is top among best home remedies for dry eyes patients. Since, dry environment will worsen the red eyes condition, necessary to keep your surroundings moist. This can be achieved with indoor humidifiers and air cleaners. Both of them avoids dry air and keeps your room moist.